Editor’s note: It’s never too early to begin thinking about booking a holiday cruise, especially if it involves convincing family members to all take time off together. 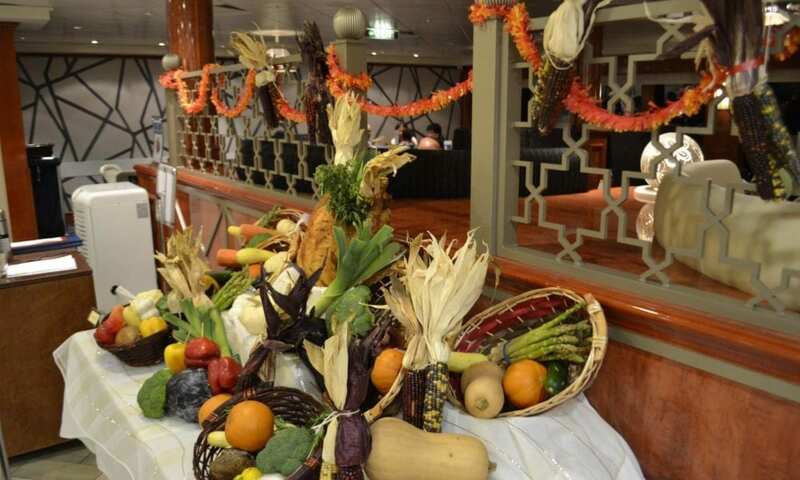 What should you expect when it comes to Thanksgiving dinner on a cruise ship? Our guest columnist gives you the scoop. Taking a Thanksgiving cruise isn’t for everyone, especially since it can mean opting out of spending the holiday with friends and family. But this year, my husband and I decided to take advantage of the fact that we had two days off, and we jumped on the Norwegian Gem. Thanks to the two extra days off and the ship’s itinerary, we were actually able to do an 11-day trip out of New York City. Having previously sailed a Norwegian ship for Halloween, I assumed Thanksgiving would see the cruise line decorating the ship and serving up turkey with all the fixings. In other words, I wouldn’t feel as if I was missing out on the holiday. Anticipating that everyone on board would want to eat Thanksgiving dinner in the main dining rooms, I booked the Grand Pacific dining room as soon as reservations were available (In this case, that was 80 days before sailing). The cruise was a completely normal one until Thanksgiving day – at which point the crew put up decorations all around the ship. Sure, they were mostly cheesy cutouts, but it did make the ship feel more festive! My reservation was for 6:30 p.m., which was probably the most popular time to sit down for Thanksgiving dinner. The line outside the dining room was about a hundred people long, so I went directly to the host’s stand and asked what to do if I had a reservation. I was told to go to a second host stand since it was already my reservation time. We were seated pretty quickly and perused the menu. The Thanksgiving-themed items were Butternut Squash Caesar Salad, Pumpkin Soup, Penne in Pumpkin Cream Sauce, Roast Beef with Mashed Sweet Potatoes, Roasted Holiday Turkey, Pumpkin Cheesecake, Sweet Potato Bread Pudding, and Pecan Pie. The turkey entree came with all the traditional Thanksgiving sides: cranberry sauce, stuffing, yams, green bean casserole, and gravy. I wanted to try as much of the Thanksgiving food that I could without being wasteful. First up was the Butternut Squash Caesar Salad. It was exactly what I expected. I actually laughed when I saw this item was listed because it felt like such a lame attempt to have a Thanksgiving-themed salad on the menu. But I had to try it! It was fine, just not really a Thanksgiving-food win. For entrees, we picked the penne and the turkey. I have to say, the penne was weird. I was so excited about this because I love pumpkin and I love cream sauces. To be fair, I didn’t read the part that said, “roasted acorn squash, pancetta, spinach, and gorgonzola.” I thought it was going to just be pasta in a thick pumpkin cream sauce. It wouldn’t have been a big deal except that these flavors did not go well together. Particularly the pancetta and gorgonzola. Had they left the bacon off and used feta instead of blue cheese, this dish would have not only tasted better but been a vegetarian item, too! Also, why so much spinach? I ate some of the pasta —which there actually wasn’t that much of — and gave the rest to Husband before moving on to the turkey. Finally, something right! The turkey was cooked beautifully. The entree came with two slices of white meat and one slice of the dark. I’m a dark meat person, but even the white meat was tender and delicious. I didn’t try the yams or green beans because of my aversion to cooked vegetables, but I really liked the apple chestnut stuffing and cranberry sauce (I’m pretty sure the cranberry sauce was just jellied cranberry sauce that was mashed up, but that’s the only reason I liked it!). The giblet gravy was also delicious. My husband said the yams were good and the green bean casserole was… well, pretty much your standard green bean casserole. At last, it was time for dessert! We ordered the pumpkin cheesecake and pecan pie. I don’t actually like pumpkin pie that much, so I was glad that it was cheesecake instead. It turned out to be more pie-like than cheesecake-like. Not so good for me, but very good if you like pumpkin pie. I was more excited for the pecan pie, which was apparently cooked on a baking sheet and cut into squares. The caramel ice cream was delicious, while the pie was ok. It was made with way too many pecans and didn’t have that nice gooey layer a pecan pie is supposed to have. In addition to the Thanksgiving items, we actually ordered four other things off the menu that weren’t holiday-themed. The stand out was definitely the Lasagne al Forno, which more than made up for the weird pumpkin pasta. I also got a mushroom tart appetizer, which I regretted because it wasn’t as good as I wanted it to be. In hindsight, I should have gone with the pumpkin soup. There just wasn’t very much filling to the tart, so it was mostly puff pastry. Otherwise, it was good. After dinner, I wanted to check out what some of the other venues were offering, Thanksgiving-wise. First, I went over to O’Sheehan’s where they had the same turkey plate as the one served in the dining room. This was kind of a nice idea, I assume to try and prevent the dining rooms from becoming overcrowded. But they probably should have added the pumpkin soup, squash Caesar salad, and one or two of the desserts to the menu if they really wanted to attract guests. When I walked by, the place was completely dead – while the dining room was still packed. Next, I went up to the buffet to see what they had to offer for those who didn’t want to stand in line at the main dining room, but wanted more than O’Sheehan’s had to offer. There were decorations throughout the buffet area, including a few nice displays. Food-wise, some of the holiday-themed offerings were the same, while others were different. There was a pumpkin chili (which I should have tried, just to see how it was). There was also a pecan pie at the buffet which was better than the one in the main dining room. Other items that weren’t available in the dining room included sweet potato pie, pumpkin torte, a turkey antipasto salad — made with turkey sausage, roasted pumpkin, pecans, red onions, and cranberries — as well, of course, as the standard buffet food you’d expect. Perfect for people who weren’t looking for a Thanksgiving meal. The decorations were a lot better. Outside of the various food offerings, the only other Thanksgiving-related activity I noticed during the cruise was a round of trivia which focused mostly on turkeys. Overall, my Thanksgiving dinner was great and I have no regrets about not celebrating the holiday back home. I just might be a bit more wary about what I order next time – taking a closer look at the listed ingredients and thinking about how they’ll combine.